Got a chance to wrapped a very simple gift to a friend. Last Sunday, I was invited to join her birthday celebration. Glad that I am one of those! As you can see here, I gave her a Victoria Secret hand and body lotion. 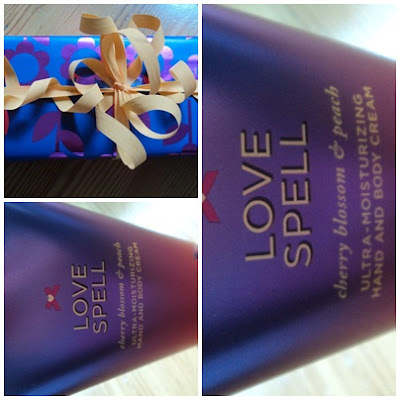 This is love spell, known as best scent and I really love this one too. So then, I tried wrapping it with cute orange ribbon on it! So nice right? I love my own. Well, the following day, got an SMS from her telling that she likes my gift. So flattered! I love people who truly appreciate simple things given to them. Maybe I need to buy some more Victoria soon. Will see. This entry was posted on 12:41 PM and is filed under Blogging , Victoria Secret , Wfashion . You can follow any responses to this entry through the RSS 2.0 feed. You can leave a response, or trackback from your own site. And tell me when will you order again my dear:-) Thanks again!